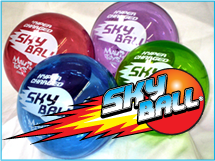 No one understands how Skyball bounces as high as it does. And to be honest the only person in our company who understands it is our head scientist, whom we have stashed away on a desert island in the middle of the Pacific Ocean, (OK, it's Hawaii- Maui and probably some nice resort) but what we can tell you is it's not just the Helium inside that makes Skyball bounce up to 75 feet. We also know that it provides hours of fun, challenging your friends, challenging yourself, playing catch or super handball. Available in an array of cool colors (Red, Blue, Green & Purple). "Catch the Wave". 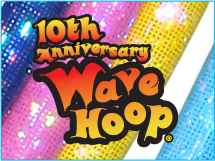 Wave Hoop has been the number one selling hoop this decade! It has been in the top 10 summer toys the past 10 years, today's kids know "Wave Hoop" before "Hula Hoop". The patented liquid core makes hooping 10 times easier than a regular hoop. Wave Hoops make hooping cool with their holographic colors and its liquid core, there is nothing like it on the planet.